We know Propelio works wonders. It has for us! That’s why we offer a risk-free, 7 day free trial (no credit card needed) and a 30-day guarantee. If Propelio doesn’t work for you in the first 30 days, no problem. We’ll give you a full refund. Best Suited for Investors that Need Credibility and Lead Capture. Use one site for your business or create several custom sites to meet each business need. 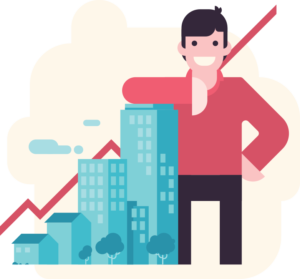 Designed with the serious investor in mind, this option solves many of the most challenging problems for your business: fresh leads and instant MLS comps! Do you enjoy saving money? This is the plan for you! Daily lead lists, MLS comps, and high equity deal alerts all available at a much lower annual price. Is this the same comps information that I can get from a licensed real estate agent? Yes! All comparable sales data is provided to you instantly, 24/7, by a real estate broker in your area. This includes all the information you will need to quickly analyze your investment properties. The comparable sales data is provided by a broker directly from the local REALTOR’S MLS. We also gather property information from public records and other sources. Data is “live” and updated every 15 minutes. Are there monthly contract fees, startup, or cancellation fees? No. We feel confident in our product and the value it will add to your company. We firmly believe that if we deliver on our promise to add value, then there is no need for contracts or hidden fees. Membership is automatically renewed each billing cycle until you notify us of cancellation. You can cancel at any time, for any reason. To cancel, simply contact us through the support button located on the top of each page, and indicate that you wish to cancel. We believe in Propelio and we want you to feel the same way. If there is ever a time within the first 30 days that you don’t feel like Propelio is the right fit for you, just reach out and let us know and we will promptly refund your first months charge. What kind of information do I get with the motivated seller leads? We provide various lists that require different specific data needs, but you will always get the address of the subject property, mailing address of contact, and a point of contact. You can see a sample list of our different lead types by clicking HERE (Halfway down page, link to sample reports) or by taking a DEMO. Will the monthly subscription rate ever increase? No, your plan price will always remain the same. In addition, you will receive all future enhancements with no change to your subscription costs, as long as you keep your payments current and do not cancel your plan. Yes! You can upgrade or downgrade your account at any time for any reason. Just contact us through the support button located on the top of each page and let us know what plan you would like. Your first bill will be due at the end of your trial period. The following bill will occur on the same calendar date, either monthly or annually, depending on your plan. How does Deal Alerts work? Propelio monitors the active listings on the MLS to locate properties that are priced under market value and meet your criteria. Propelio uses an automated valuation to determine the listed property’s value based on sold properties nearby, and if the property is listed for less than retail and meets your discount needs, we mark it as a potential deal for you. Can I get a demo before I subscribe? Yes, we provide live one-on-one demonstrations to show you how Propelio works. Click HERE to schedule your demo. What areas are the motivated seller lists provided for?